I’ve been meaning to write this post for a few weeks now, but for one reason or another, it just wasn’t happening. However, an update of sorts is definitely in order as a few things have changed since my last post about My (Almost) Dairy-Free Experiment. If you’re a regular MIS reader or you follow me on Instagram, you’ve probably noticed that dairy is back in my life. Namely in the form of yogurt and cheese. I’m not consuming either in large quantities, but they’re part of my diet again. Back in early January, I was seeing some positive results after not consuming dairy for a month or so. If I remember correctly, this trend continued for another two weeks before my skin decided to go berserk again. I honestly have no clue what went wrong. And it didn’t get any better. In fact, it got worse. I went from a few big bumps to full breakout mode in a matter of weeks. Even still, I persisted on with my almost no dairy plan. Right before we left for Italy, I saw a friend of mine post something on Facebook about a new line of products from the creators of Proactiv. I texted her to learn more. After a brief phone conversation, I signed up to try Unblemish*, a line of products designed to help acne-prone skin. Now, I know I’ve been harping the benefits of more natural treatments, but I felt hopeless (once again) and was ready to try something new, something a bit stronger. Anyway, I started using Unblemish and within a few weeks, my acne was subsiding. I still had a few bumps, but they were less painful. I used it for 60 days and ultimately decided to only continue with the blemish treatment (a benzoyl peroxide lotion). This stuff isn’t cheap, and I felt that the lotion was making the biggest impact for me. Well, that was exactly a month ago. I just got around to ordering more of the Unblemish treatment. But guess what? In the last month, I haven’t been using any fancy products (just a little tea tree at night) or following any particular diet, and my skin is the best it’s been in a long long time. I even ran errands the other day without makeup (this was a HUGE step for me). I’m totally waiting for the other shoe to drop and my face to go crazy again, but we’ll see. I’m crossing my fingers that the “not doing much of anything” approach keeps working. Time will tell. I should also mention that Vishnu thinks stress is a major contributor to my acne. I’m what you would call a chronically stressed person but not in an obvious way. I’ve always just thought it was part of my DNA, but Vishnu now has me convinced otherwise. And he may be on to something. Since the beginning of this year, I’ve been constantly stressed/worried about one thing or another. But over the last month, particularly the last few weeks, I’ve been trying really hard to chill out. I’ll share more on what I’ve been doing in a separate post, but overall, I think my efforts are helping. Sure, I still get a little stressed, but I’m not holding on to it anymore. And of course I have absolutely zero proof of this, but in the past few weeks, my face has been clearer than ever before. So maybe Vishnu’s right. I’m going to pay more attention to my skin during high stress times to see if it’s a factor. So where does that leave me? Well, as of right now, I’m sticking to a very simple routine that includes the Soothe face wash, my Desert Essence face wash, tea tree oil, Trader Joe’s moisturizer, and Cetaphil face cream as needed. I also plan to use the Unblemish lotion as a spot treatment (if things get bad again). In terms of diet, I’m sticking to a vegetarian diet that includes a little dairy here and there. And most importantly, I’m trying to be as stress free as possible! Like I said, we’ll see what happens next month, but for now, I’ll take as much clear skin as I can get! *The Unblemish face wash contains sulfur as a main ingredient. After using it for a couple of weeks, I found out I’m allergic to sulfur…the hard way (i.e. SUPER itchy, red skin). My friend was kind enough to send me the Sooth face wash to try. I’ve been using that for the past few weeks and love it. I am exactly on the same boat as you right now. I have days or weeks where I have fairly okay skin, then i god know what happens, I break out. I have been dabbing little tree tea oil as well but currently not taking any antibiotics/prescription lotion but if things get bad again, I will have to seek medical care. You should check out the Unblemish line, D! It works really well! Awe best of luck on your journey. Have a look at using non foaming cleansers. SLS or anything that foams are big triggers. I think you’re right about that because the Soothe face wash is non-foaming and it doesn’t break me out all. In fact, it leaves my face super smooth! I’m glad you’ve found something (or nothing?) that works and you’re getting some relief, especially from the stress. Can’t wait to read about how you’ve been managing it! Thanks, Kacy! Things change by the month around here, but I’m hoping if I keep my stress levels down, it makes a difference. Fingers crossed! Oddly… I really didn’t try anything too crazy, I just started using my regular acne medication and lately just been a little less stressed. I do thing diet and stress are major contributors! I haven’t heard of Unblemished, but I’ll be sure to check out. I’m glad you’re not as stressed and that you’re seeing some good results. I am kind of curious to see how next month goes with my face. I think for me it’s partly stress and partly hormones. The Unblemished really helps so hopefully the beast stays tamed this time around! I’m glad your skin cleared up! It’s such a pain – in so many ways. Not sure if this helps.. In the past when I had moderate acne, I used Tazorac, it’s like retin-a.. but it worked wonders for me. During the day I used Duac. Also, stress is a big contributor. Lack of sleep will do it. Eating lots of sugar I’ve noticed I breakout. Also, I find going heavy on carbs will do it. And then of course.. the changes in hormones a week before the period. I used Tazorac for a while but it didn’t work for me unfortunately. Love hearing this. I definitely believe the stress factor because I’m always stressed. Still trying to find something that works, but I think you’re right, because the times my face has been best, I wasn’t on any of the expensive treatments I’ve tried out. Thanks for the comment, Sarah! You’re not the only one dealing with this…I promise! I’m finding that less is more in the case of my face. And I’m hoping that by stressing less and finding ways to cope will only help. Good luck to you! Sugar, dairy, and lack of sleep totally wreak havoc on my skin. Not sure if this will ever end? I feel like I’m too old to still be having skin issues! I feel the same way! When will it end?! We are always concern about our beauty and skin, that’s why making the best of everything to have a healthy skin is important. Thank you for the tips you have shared. I’ll make sure that the food I eat won’t affect and trigger my acne. Having a healthy diet is good for the skin. What you have taken in will affect your outside appearance, There is a physical interaction of the food we eat to our skin. 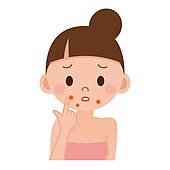 However, acne will not completely diminish, if the only proper diet is implemented, it is important to incorporate it with a healthy workout, proper hygiene and of course supplements.